Product does not include golf balls or tees. VisiPak Golf Ball Tubes and Containers give your promotional campaign the additional impact it deserves. 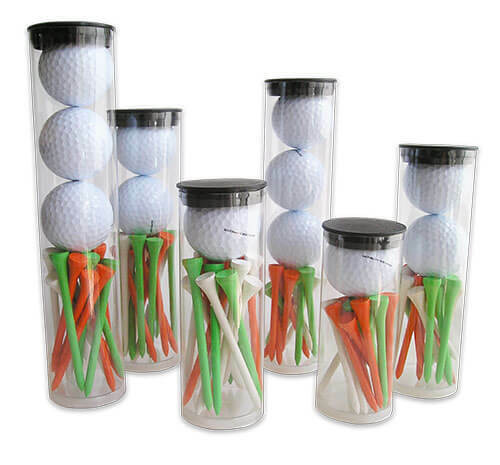 The crystal clear packages protect and display balls and tees. VisiPak can easily print your logo or artwork directly on the tube adding value to the package. Golf Ball Tube container packages are intended for use as promotional items, principally aimed for golf tournaments or related events. Also, these are great retail packages for Pro Shops in golf course clubhouses as they make a great gift. The tubes feature one permanently sealed end and a plastic plug with a thumb tab for easy removal. Tubes and plugs ship together to save on shipping cost. Note: Golf balls and tees are not included. VisiPak offers another type of packaging especially designed to fit golf balls--CLAMSHELLS. Follow the link to learn more about our other featured golf container.